October 19, 2014 By This post may contain affiliate links. Hi Everyone! 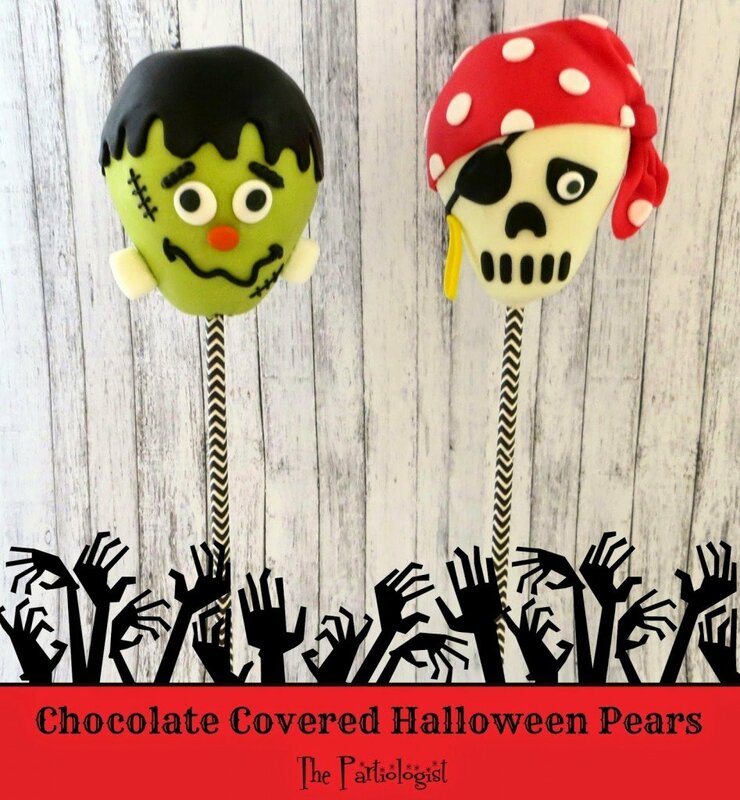 I’m Kim, The Partiologist and I’m here with some delicious Halloween Oreo Cookie Pops! 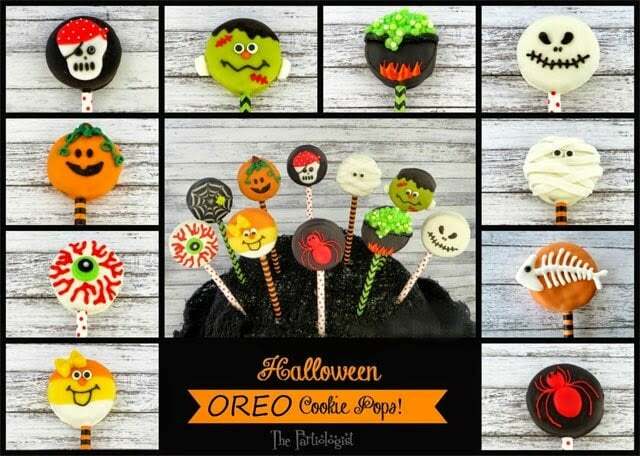 Have some fun with your kids and decorate these cute treats however you’d like! 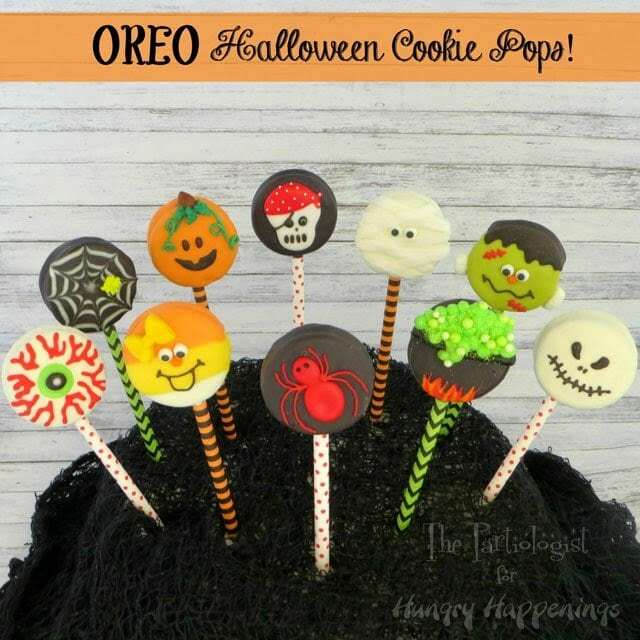 At a glance, you might think these Halloween Oreo Cookie Pops will be a lot of work, but we’ll start out slow. A few of the supplies – Oreo’s of course, cookie sticks and candy melts. Insert the stick in the center of the Oreo. The mummy was pretty simple. Start by melting white candy melts in a microwave safe bowl. I like to use mason jars so when I’m finished I just close the lid until I need it again. Now that you’re cookies are ready to be dipped, dip FOUR cookies in the white candy melts and set aside. Add royal icing eyes to the first white cookie, by placing a bit of candy melt on a toothpick, then on the back of the eye. Next, using Ateco decorating tip #44 and a bag of frosting, pipe lines across the mummy face, not covering the eyes. Remove the excess frosting from the sides with an offset spatula. Dip another white cookie three quarters of the way, into yellow candy melts. Let dry. Dip again, one quarter of the way, into orange candy melts. Add royal icing eyes with bit of frosting. Pipe on a smiley face (candy corn is happy corn) with tip #1 and black royal icing. Add a dot of orange royal icing (or a mini orange m & m) for the nose. Now it’s time to dip four additional cookies into the black candy melts and set aside. Add royal icing to the top of one black cookie. Immediately pipe three white circles, with a dot in the center of the royal icing. Drag a toothpick from the inside out, making the web shape. 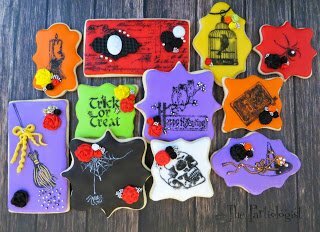 Add a little candy spider to the cookie before it dries. Now let’s make the cauldron…take a black cookie and pipe a curved line across the tip with frosting and a tip #7. Add bits of fire to the bottom of the cookie by piping yellow and red royal icing with tip #2. Outline the sides of the cauldron with frosting and Tip #2. Pipe neon green frosting dots to the top of the cauldron. Add candy pearls and edible glitter to finish it off. With the next black cookie, I used a mini skull cookie cutter to press a mark into the cookie. Follow the outline and pipe white royal icing to make the skull. Let the white skull dry. After the skull has dried, add a red bandana to the top with royal icing and a #1 piping tip. Before the red icing dries, add tiny white dragees with a tweezers. Add the eye patch and eye, nose, and teeth with black royal icing and tip #1. Make a dot of royal icing for the eye, add a bit of white to the center and add a tiny black dragee to the center of the eye. After melting neon green candy melts, dip one cookie and let dry. Pipe a jagged edge across the top of the cookie and fill with royal icing, using tip #2. Add the royal icing eyes with a bit of frosting. Add a mini orange m & m for the nose and pipe the mouth and scars with black and red royal icing. Dip two cookies into orange candy melts. For the pumpkin, add a face with black royal icing and tip #1. Pipe green frosting with tip #1 for the curls and add brown frosting for the stem with tip #4. Add two green leaves with Ateco leaf tip #349. Pipe a skeleton fish on wax paper with a #2 tip and royal icing, let dry over night. Remove the royal icing from the wax paper and place on the orange cookie. For some reason that cookie didn’t make it in the photo shoot. With another white cookie, add a face to make your Jack Skeleton cookie by piping royal icing with tip #1. Make your last white cookie into a blood shot eyeball. Pipe a big round dot of green frosting into the center of the cookie. Add black frosting to the center of the green and then white frosting to the center of the black. Add red squiggle lines to the outside of the eye with a #1 tip and red royal icing. Now they’re ready to go trick or treating…wait the trick’s on them, they’re the TREAT! Awesome Kim! Great to see you here! Thank you Susan – I'm so excited to be here!! Thank you Karen for the sweeeeeeet comment, I'm so excited to be here! I'm not sure if I've been living under a rock or what, but I had no idea you could 'dip' oreos like this! I thought you had to use a mold!!! You just simplified my world Kim! Thank you 🙂 Jennifer G.
Beth and Kim, you are both amazing. I love all of you creative ideas! Kim, these fantastic, and I love the tip about the mason jar. I'll keep that in mind for next time! Thanks. Thank you Hani, Beth is so very creative, I love being here and I know you'll love using the mason jar! !